For hobbyists, there are two types of machines that can make parts at home. The first type is matter-adding machines (3D printers) and the other is matter-subtracting machines (like CNC milling machines). [Mario] recently tipped us about an article he made detailing which free software can be used to design and produce parts on CNC machines. The first step of the process is obviously designing the part you want to make using a Computer-Aided Design (CAD) application. [Mario] suggests Heeks or Freecad for which you can find plenty of tutorials on YouTube. 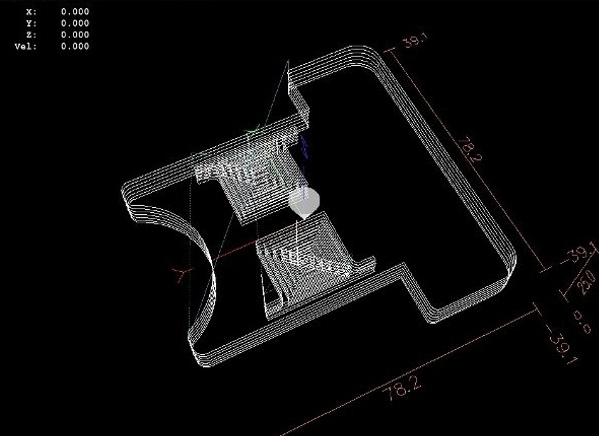 The next step consists in converting the part you just designed to machine tool paths using a Computer-Aided Manufacturing (CAM) application. Fortunately, Heeks can do both so it may be the best option for beginners. [Mario] also mentions the pcb2gcode application, which allows you to manufacture printed circuit boards at home for the prototypes you may want to produce. Finally, the well known LinuxCNC (previously Linux EMC2) software is used to control the CNC machine using the GCode that the CAM software produced. At Hackaday, we’d really like knowing what our readers currently use for their CNCs so don’t hesitate to leave us a comment below. Ever heard of DesignSpark? They are releasing a powerful CAD package on September 16th — for free! The company is owned by RS Components, a distributor of electronics and maintenance products. They offer a large library of 3D models of parts that they sell, dubbed the ModelSource. So if you are wondering how they are giving out software for free, that’s how. They also have free PCB designing software, and something called DesignShare which hosts open-source project collaboration, sharing and discussions. By the looks of the demo video, DesignSpark Mechanical is a well laid out CAD package that is rich in features. The software allows for the import and export of several file types, and it looks like ECAD, OBJ, Sketchup, STEP, DXF and STL are all there, as well as the native file types. While it looks like you can import any files, we are willing to bet adding ModelSource files are by far the easiest and most convenient because of the integrated ModelSource library. But we think that’s a small price to pay for an alternative to SketchUp. After all, the component models will be useful for assemblies, even if you don’t order through them. Oh, and it’s perfect for making free models for 3D printing as it includes the ability to export STL files. Watch the software demo after the break.